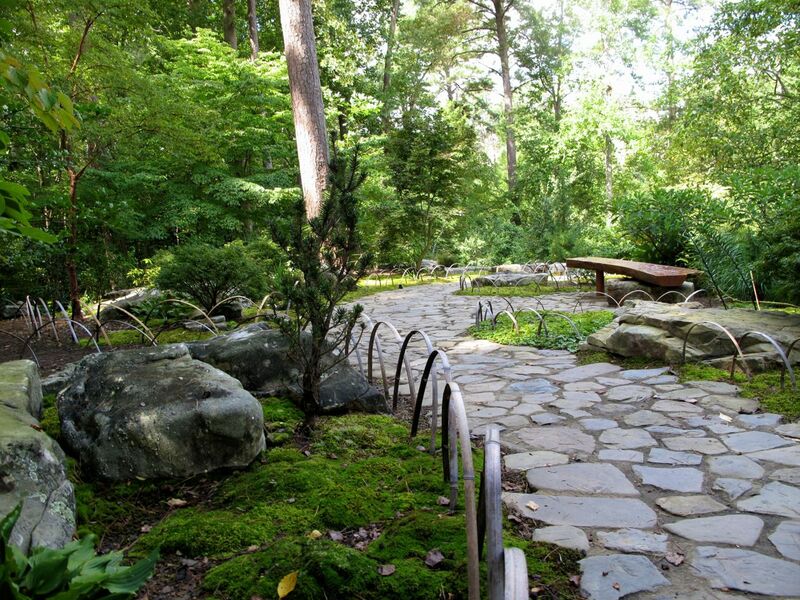 This morning we took advantage of the weekend’s unseasonably cool temperatures to walk through portions of nearby Duke Gardens, beginning with the Asiatic Arboretum. Along with lovely plants this part of the garden is filled with carefully placed stones, lanterns and water features. A new moss garden was one of the peaceful highlights. It will be interesting to see how this matures over time. 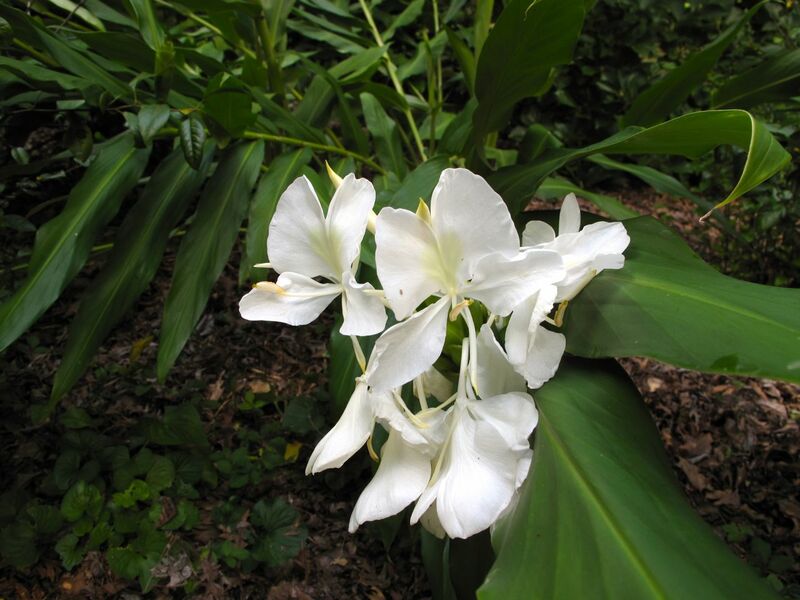 A most heavenly fragrance led us to admire an enormous cluster of flowering Hedychium coronarium (Ginger lily). 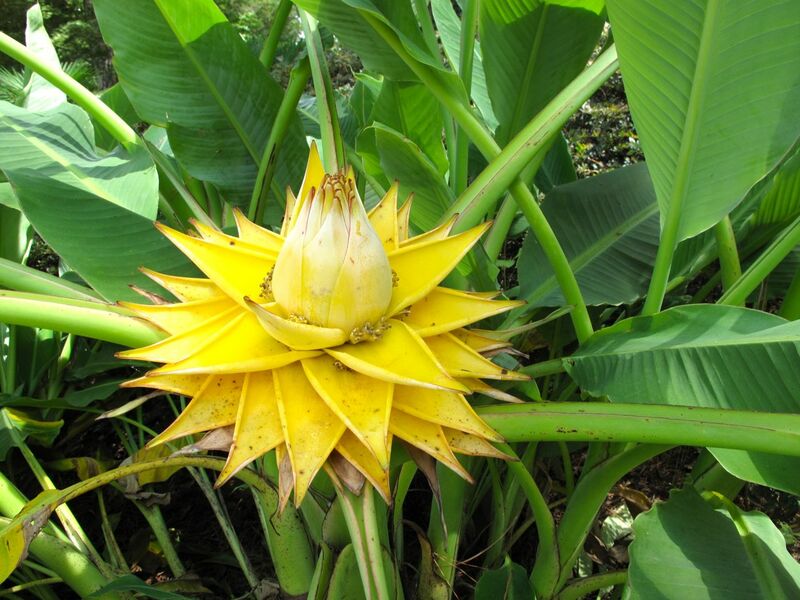 This large, yellow-hued flower belongs to a Dwarf yunnan banana. A popular attraction in the Asiatic Garden is a garden pond filled with waterfowl and accented at one end with a red Japanese style arched bridge. As we wended our way from one end of the pond to the other I found the many forms of stone especially appealing. I would love to add a huge boulder to my own garden. After leaving the Asiatic Garden we passed the butterfly garden where Hibiscus and native Joe-Pye Weed were among the many plants, but only a butterfly or two were there to enjoy them. 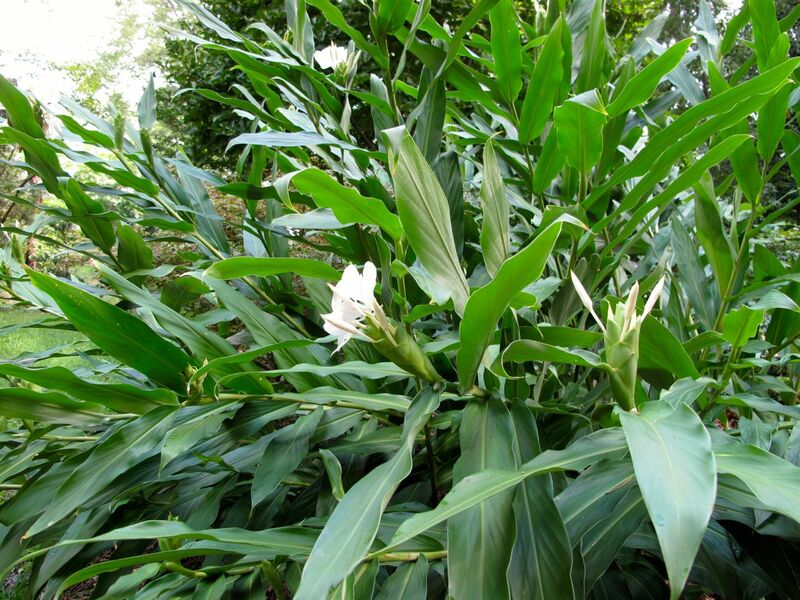 Eventually we made it to the Terrace Garden where abundant grasses were playing an important role. The pink plumes of grass swayed gently in the breeze, not really coming into focus for the camera, nor even in person. Unfortunately I could not find identifying labels for this set of plants. At half past noon as we were on our way home the thermometer had risen only to 77°F. It was a lovely August morning. This entry was posted in garden and tagged almanac, late summer garden, public gardens, Sarah P. Duke Gardens on August 25, 2013 by pbmgarden. Thank you for sharing your pleasant walk Susie. I am attracted more and more to moss gardens, so very restful to the eye. You are very lucky to have these gardens so close to home. Glad you enjoyed it Christina. 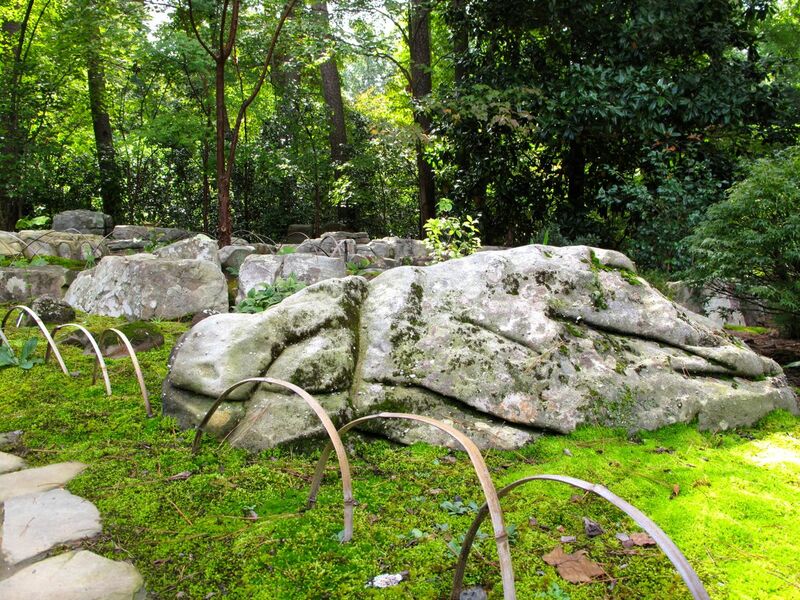 Mossy gardens do seem restful. Oh, to have huge rocks to play with, they are beautiful ! The flower heads on the grasses are also beautiful, it must have been a magical sight with them blowing in the breeze. Thank you for sharing your morning stroll with us. That grass was just delightful Pauline. I would love to add some large stones to my very flat garden–it would be fun. That banana flower is amazing! I agree Cindy, very amazing. Thanks for the pictures, the Asian garden looks so restful, and I love the grass. The terrace garden looks so different from the last time you showed it. We didn’t explore much of the terrace garden but the grasses really enhanced the planting I thought in that section. I do want to explore the Asian garden more–supposedly there is a teahouse somewhere. 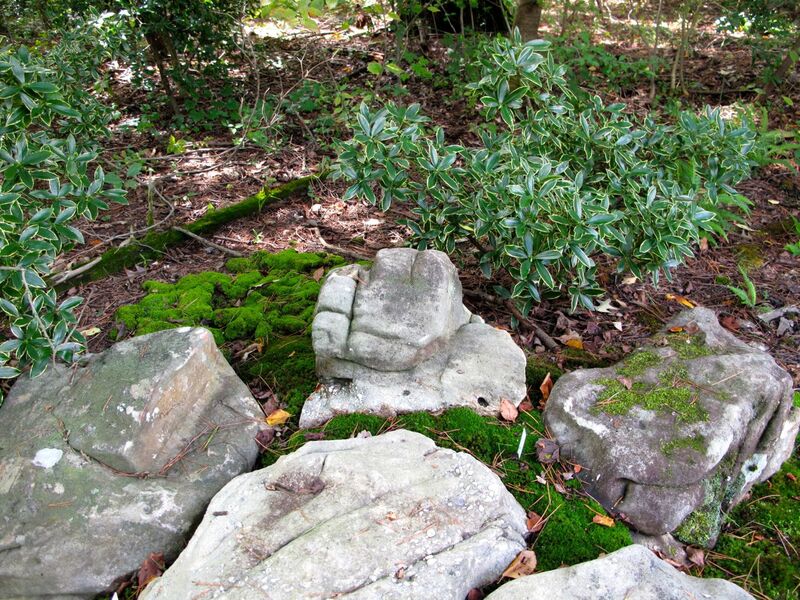 Those grasses really are lovely – rocks and moss are features that add harmony to a garden. It looks quite autumn-like there already. Yes, Harmony–good description. There was moss in the meditation circle last year, which I was encouraging, but it has disappeared. School started back this week, the weather is cooler than usual, the light is lower–does feel like autumn is on the way. The Asiatic garden looks so peaceful and that Yunnan banana is beautiful. It was peaceful. There were many nooks and crannies we didn’t explore within the Asiatic Garden so I’m looking forward to going back this fall. Hi Susie, I’m not really into the japanese taste for gardening, quite the opposite indeed, but I have to admit that the moss garden really impressed me, it’s very original and relaxing (although I would not waste all that gardening space for only moss…). That beautiful pink feathered grass is melinis nerviglumis, origin from South Africa and not hardy in my climate, but as I’ve been digging on it for quite a long time I’ve gathered quite a lot of infos about it. Apparently it has to be treated like an annual but it self seeds very easily so that you can virtually consider it a perennial. It’s quite difficult to find here so I’ve never tried it yet. Love that grass too, although I’ve never seen it for real, I must admit. As I maybe wrongly expressed I liked the moss garden and the idea of it, I just wouldn’t cultivate one, just as you said. The butterfly garden with the Eutrochium (Joe-Pye Weed) looks interesting. Yes, a nice native to attract pollinators.